Leave Bangkok’s bustling streets for a full-day electric bike tour of Damnoen Saduak floating market and the scenic Thai countryside. Enjoy the freedom to pedal your bike or simply cruise along the 20-mile (32-kilometer) route. Explore canal-side trails and pause for a riverside lunch, then visit fruit plantations and a pair of historic temples. 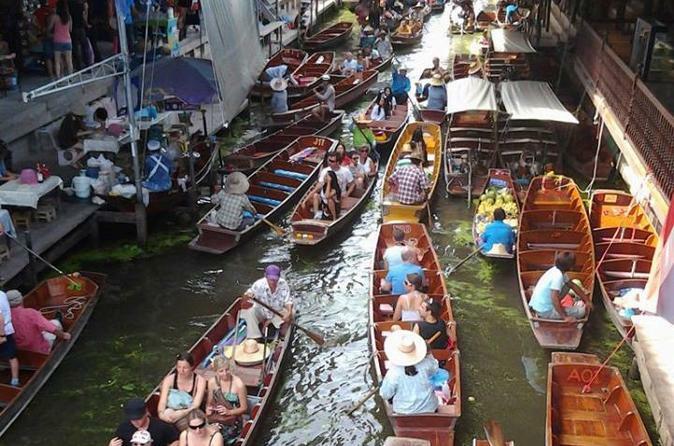 Return to the canals to browse ripe produce and traditional handicrafts sold by vendors in wooden boats before returning to Bangkok in a comfortable minibus.